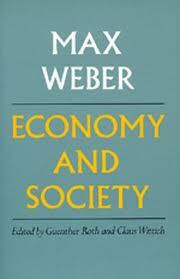 Economy and Society is a book by political economist and sociologist Max Weber, published posthumously in Germany in 1922 by his wife Marianne. Alongside The Protestant Ethic and the Spirit of Capitalism, it is considered to be one of Weber's most important works. Extremely broad in scope, the book covers numerous themes including religion, economics, politics, public administration, and sociology. A complete translation of the work was not published in English until 1968. In 1998, the International Sociological Association listed this work as the most important sociological book of the 20th century. For the purposes of a typological scientific analysis it is convenient to treat all irrational, affectually determined elements of behavior as factors of deviation from a conceptually pure type of rational action. For example a panic on the stock exchange can be most conveniently analysed by attempting to determine first what the course of action would have been if it had not been influenced by irrational affects; it is then possible to introduce the irrational components as accounting for the observed deviations from this hypothetical course...Only in this way is it possible to assess the causal significance of irrational factors as accounting for the deviation of this type. The construction of a purely rational course of action in such cases serves the sociologist as a type (ideal type) which has the merit of clear understandability and lack of ambiguity. By comparison with this it is possible to understand the ways in which actual action is influenced by irrational factors of all sorts, such as affects and errors, in that they account for the deviation from the line of conduct which would be expected on hypothesis that the action were purely rational. (4) traditional, that is, determined by ingrained habituation. In Economy and Society (part two, chapter VI), Weber distinguished three ideal types of religious activity: world-flying mysticism, world-rejecting asceticism, and inner-worldly asceticism. He also separated magic as pre-religious activity. ^ "ISA - International Sociological Association: Books of the Century". International Sociological Association. 1998. Archived from the original on 2012-10-10. Retrieved 2012-07-25. ^ Weber, Max. "Basic Sociological Terms". In Economy and society; an outline of interpretive sociology. New York: Bedminster Press, 1968. 4. ^ Weber, Max. "Basic Sociological Terms". In Economy and society; an outline of interpretive sociology. New York: Bedminster Press, 1968. 6. ^ Weber, Max. "Basic Sociological Terms". In Economy and society; an outline of interpretive sociology. New York: Bedminster Press, 1968. 24-25. ^ Weber, Max. "Asceticism, Mysticism and Salvation". In Economy and society; an outline of interpretive sociology. New York: Bedminster Press, 1968. 544-545. ^ a b Weber, Max. "Asceticism, Mysticism and Salvation". In Economy and society; an outline of interpretive sociology. New York: Bedminster Press, 1968. 542. This page was last edited on 16 February 2019, at 01:00 (UTC).